Are you seeing spots? Brown spots, age spots, liver spots? Whatever the name, they are melanin that have clumped together or produced by your skin in high concentration, often in response to frequent UV exposure, or in some cases of hyperpigmentation, as a result of hormonal changes or scars. The good news? Treatment for pigmentation comes in a variety of forms, so you can choose ones that you are most comfortable with. With sunscreen and skin lightening products – and patience – you can even out the color of your skin. How Do Skin Lightening Products Work? Dark spots or other areas of hyperpigmentation are seldom cause for concern, but they can be a cosmetic annoyance: some spots can become more or less permanent. You don’t have to live with it, especially when there are so many skin pigmentation removal products that are available for you to use at home. Skin lighteners, skin bleaching creams or skin brighteners often work by blocking the activity of the enzyme responsible for making the pigment melanin. You can get a prescription-strength product for pigmentation from your skin care specialist, or from over-the-counter drugstores for a gentler approach. Either way, they work on melanocytes which are a group of cells producing the pigment and are found at the base of the topmost layer of the skin or epidermis. For skin lighteners to work, they have to get to this layer, the stratum basale, of the skin. Once skin lighteners penetrate the stratum basale, the active ingredient or combination of ingredients inhibit the activity of tyrosinase, which is the enzyme that controls the production of melanin. Tyrosinase becomes activated when they come into contact with UV light, which is why along with skin lighteners, it’s crucial to use at least SPF30 sunscreen even when it’s overcast. If tyrosinase activity is disrupted, melanin production slows down. This is how hydroquinone lightens hyperpigmented areas of the skin. Hydroquinone, for decades the evidence-based treatment for hyperpigmentation is the main active ingredient in Dr. Sylvia Skin Care products that fade away melasma, age spots, liver spots, freckles and scars. 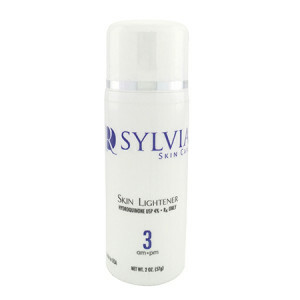 Dr. Sylvia’s Advanced Clear Skin program starts off with Skin Lightener 3 that contains 4% hydroquinone applied in the morning and evening after cleansing and toninh. Skin Lightener 3 can be used on its own, or followed by Exfoliator Forte 4 that contains alpha-hydroxy acid (by itself used for sloughing off dead skin cells) buffered to 10%. The Exfoliator is applied in the morning to improve skin texture and keep skin smooth. AHAs may increase your skin’s sensitivity to the sun, so UV exposure should be minimized while using this and sunscreen should be applied diligently no matter the weather. Removing pigmentation is more effictive if skin lightening ingredients penetrate the stratum basale where melanin is produced. This is why you need to use Balancer 5, containing 4% hydroquinone, which acts as a lightening and enriching agent in the deeper layers of the skin where melanocytes are at work. Dr. Sylvia Skin Care products have been developed by Dr. Sylvia Ramirez, a Harvard-trained dermatologist in Scotts Road, Singapore, who is also medical director of a popular laser clinic in Orchard area offering services for freckles, melasma and age spot removal.